He said this at the chief guest’s speech in the six-monthly secretariat meeting of Shibir in an auditorium in the capital today. Secretary General Mubarak Hossain, Central Office Secretary Sirajul Islam, Central Dawah Editor Shah Mahfuzul Haque, Central Literary Secretary Salahuddin Ayubi and other Secretariat members were present in the meeting. 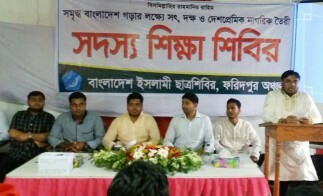 Yasin Arafat, the central president of Bangladesh Islami Chhatra Shibir, said that the work of the Islamic Movement is for the sake of Allah. For this, Allah sent us as a representative in this world. This is a huge Amanah on us. Therefore, in order to fulfill this duty spirit of accountability to Allah has to play a role while discharging responsibilities. He said this while speaking as the chief guest at a unit representatives meeting of Sylhet division of Chhatra Shibir in an auditorium at Sylhet city. The meeting was conducted by Central Dawah Secretary Shah Mahfuzul Haque, and attended by Ex Central President and Sylhet Metropolitan Jamaat Ameer Advocate Ehsanul Mahbub Jubair, former MP of Sylhet-5 constituency, Maulana Farid Uddin Chowdhury, Central Finance Secretary Hasanul Banna, Central Education Secretary Rashedul Islam, HRD Secretary Jamshed Alam, Library and Foundation Secretary Abdullah Al-Mahmood, Madrassah secretary Imran khalid and other leaders of various fields. He said this while speaking as the chief guest at a unit representatives meeting organized by the branch of Rajshahi and Rangpur Divisions of Chhatra Shibir in an auditorium of the capital. Central Publicity Secretary Khaled Mahmud supervised the program, where among others, Central College Secretary Touhidul Islam, Central Planning Secretary Jasim Uddin, and Rajshahi and Rangpur division's senior leaders were present on the occasion. Yasin Arafat, the central president of Bangladesh Islami Chhatrashibir, said that Bangladesh is one of the world's upcoming nations. But due to the lack of honest, skilled and capable people in managing the country. Because of which the country could not reach the desired goal after so many years of victory. So the talented people of the country will have to come forward to build a prosperous Bangladesh. Bangladesh Islami Chhatrashibir Secretary General Mobarak Hossain said that for a Muslim, both this world and the Hereafter were important. The world is the sowing field of the Hereafter. So, if we prioritize the Hereafter, we will achieve success in all areas. Bangladesh Islami Chhatra Shibir Secretary General Mobarak Hossain said the government is killing innocent people through police for the implementation of political vendetta. The nation is concerned about the deaths of prisoners in the custody of police one after the another. Yasin Arafat, the central president of Bangladesh Islami Chhatra Shibir, said that in order to stop the advance of Islam, the evil forces are conspiring against it through oppression, torture and propaganda. The activists of Chhatra Shibir must face all obstacles with the firmness of faith and character. In the coming days, the Dawah of Islam should be given to every student with patience and courage. Bangladesh Islami Chhatra Shibir Secretary General Mobarak Hossain said, public life has become miserable over the intensity of the winter. The condition of the poor helpless people has become highly deplorable. In this situation, the government and the wealthy will have to come forward to help the distressed cold-affected people in the winter. Yasin Arafat, the central president of Bangladesh Islami Chhatrashibir, said that the Quds is the first qiblah of the Muslims. Imperialist America has taken the final step to hand over the holy land of Muslims to the illegal Zionist Israeli entity. A reflection of this is that US President Donald Trump has recognized Jerusalem as the capital of Israel. In this situation no Muslim should remain silent. Therefore, the Muslim Ummah must be united to protect Jerusalem.